Bees might get the most attention as pollinator species, but hummingbirds are important pollinators too. Like bees, they carry pollen from one plant to another, and play a key role in plant reproduction. Hummingbirds are a colorful sight throughout North and South America, zipping from flower to flower in gardens and in parks. When hummingbirds visit flowers, they are not only feeding on the nectar, they are pollinate the flowers, which in turn allows plant to produce fruits or seeds. There are more than 300 species of hummingbirds found exclusively in the Americas from Alaska to Chile. Contrary to the old wives' tale, they do not migrate on the backs of geese. Instead, they fly up to 1,000 miles or more---quite the journey for a bird that weighs less than a penny. Hummingbirds eat some small insects, such as ants or gnats, and flower nectar is a vital part of their diet. A hungry hummingbird might visit between 1,000 and 3,000 flowers a day to maintain an adequate caloric intake. While some plants are pollinated by the wind or are otherwise self-pollinating, the vast majority rely on hummingbirds, bees, butterflies and bats to carry pollen from one individual plant to another. Like animals, plants have male and female parts, and in order for plants to make seeds so that they can reproduce, the pollen grains must be transferred from one plant to the ovary of another plant of the same species. The pollen and ovary are packaged inside flowers with bright colors or alluring scents to help attract pollinators into visiting the flowers. Most pollinators come to flowers to feed in the sugary, calorie-rich nectar, and pollination assistance is merely a coincidence. Hummingbirds have long beaks and even longer tongues, which allows them to feed at flowers that are too long and thin for anything else. When a hummingbird inserts its beak into a flower to drink the nectar, sticky pollen grains cling to the side of its beak. When the hummingbird visits its next flower, some of the pollen grains are transferred, and if both flowers are the same species, pollination occurs. 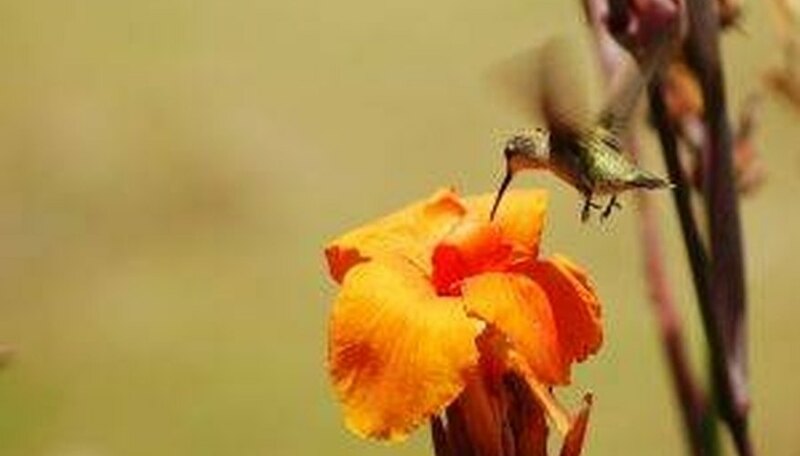 Flowers that draw hummingbirds include red flowers, although they also frequent pink, orange or other colored flowers. They also prefer flowers shaped like a tube or trumpet. Almond, Heidi. "How Do Hummingbirds Help Pollination?" Sciencing, https://sciencing.com/hummingbirds-help-pollination-4566837.html. 16 July 2018. Can Orchid Flowers Change Color?